Representing the perfect combination of high performance and high value, the Denon AVR-X540BT delivers superb sonic fidelity along with a host of advanced features including full 4K compatibility, HDR (High Dynamic Range), and ARC (Audio Return Channel) for the complete home cinema experience. 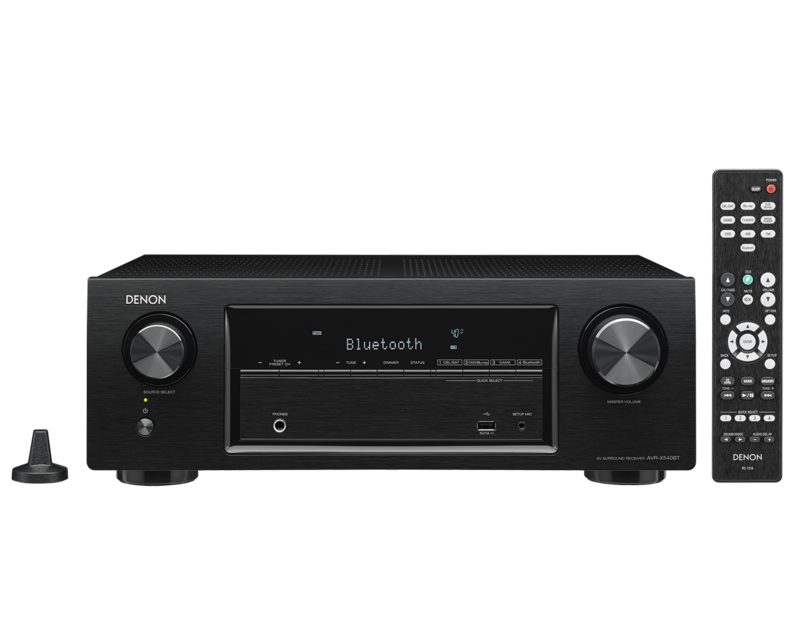 Thanks to built-in Bluetooth, the AVR-X540BT receives your favourite music wirelessly from any compatible device, and the dedicated Denon 500 Series Bluetooth remote app offers unique control options from your smartphone. Featuring high current discrete power output devices on all channels, the AVR-X540BT delivers high power and is rated at a maximum of 130 watts per channel. The Eco mode adjusts the power amplifier's output according to the volume level to reduce power consumption, with an on-screen Eco meter providing real-time monitoring of the power-saving. For compatibility with the widest range of loudspeakers, the AVR-X540BT is equipped with low impedance drive capability that provides operational stability with 6 ohm speakers. Featuring 5 HDMI inputs, the AVR-X540BT's video section features all you need for the full home cinema experience: Full 4K Ultra HD, HDCP 2.2, HDR (High Dymanic Range), BT.2020, Wide Color Gamut, 4:4:4 Pure Color sub-sampling, as well as 21:9 and 3D video pass-through. Thanks to built-in Bluetooth, you can easily stream your music from any compatible Bluetooth phone, tablet or computer. Simply select the AVR-X540BT from your device's Bluetooth menu to turn on the receiver and start playing your music. The AVR can remember up to 8 paired Bluetooth devices, so family and friends can listen to their favourite tracks. For ease of setup, the AVR comes with a setup measuring microphone that adjusts critical system parameters for top audio fidelity custom-tailored for your speaker system and listening space. It has colour-coded loudspeaker terminals, and comes with colour-coded speaker labels that help ensure correct speaker cable hookups the very first time. With our exclusive Setup Assistant along with the Quick Start Guide, you can connect and configure your home cinema system quickly and easily. The Setup Assistant features clear on-screen text that quickly and easily guide you through the setup process, optimising critical system settings for the best possible sound quality. The AVR's front panel features 4 Quick Select function buttons so you can quickly choose from the most popular sources and the system remembers your preferred audio settings for each one. The ergonomic remote control also features dedicated Quick Select buttons. 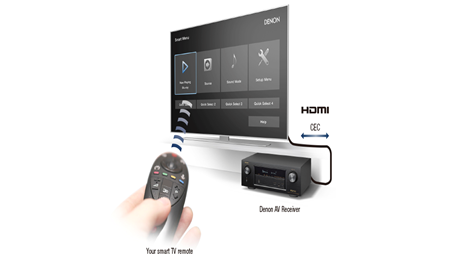 When you connect the AVR to your Smart TV, you have the option of controlling the AVR via the TV's remote control which lets you select an input, adjust the volume and choose the surround sound mode. 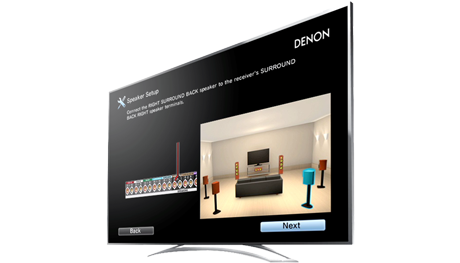 Download the 500 Series Denon Remote app and control your AVR-X540BT from your Bluetooth device. 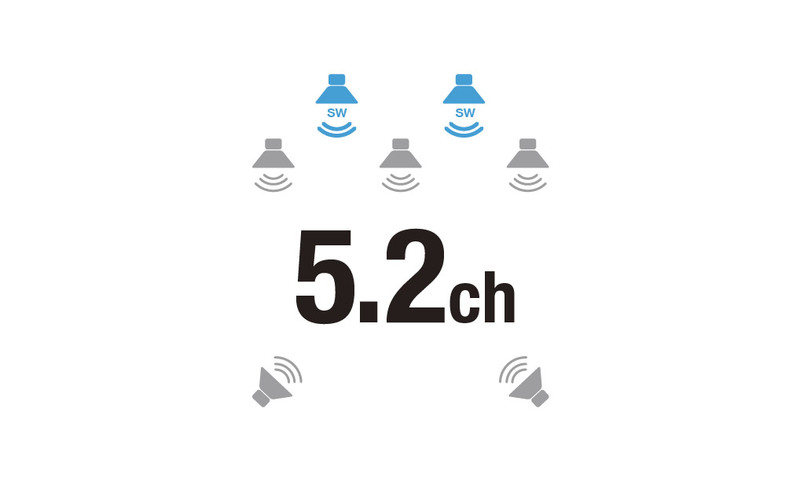 Functions include On/Off, Volume Up/Down, Mute and Source Selection. The app is available for iOS and Android version. Denon's HEOS wireless music streaming system delivers the ultimate in sound quality, ease-of-use and system flexibility. Sold separately, the HEOS Link enables the AVR-X540BT to play back nearly unlimited online music sources, like Internet Radio or popular music streaming services like Spotify, Deezer or TIDAL. Furthermore, once connected to the HEOS Link, the free HEOS app can conveniently control certain functions of the AVR.